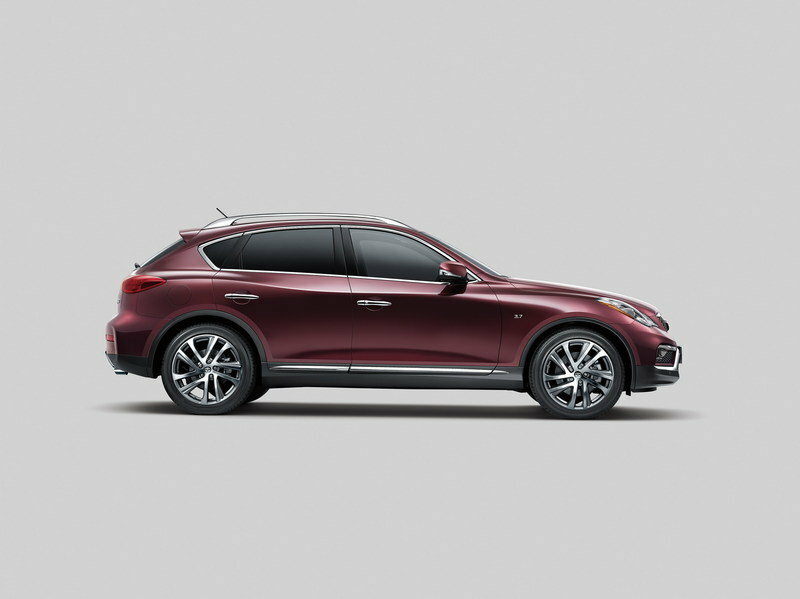 Debuting at the 2015 New York Auto Show, Infiniti has applied an extensive refresh to the QX50 in the hopes of jumpstarting the SUV after it struggled to sell well in the highly competitive luxury crossover segment. A facelift, longer wheelbase, extra interior room and a few new gadgets all make the list of updates. 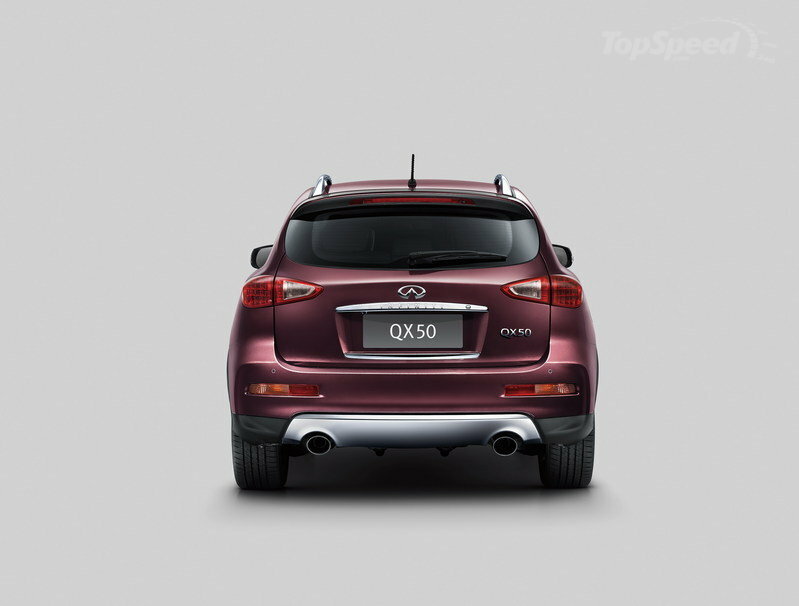 The Infiniti EX/QX50 was first introduced in 2008 as the funky-looking EX35 crossover SUV. In 2011, the model underwent its first name change to simply EX. For the 2014 model year, Johan de Nysschen — now the lead man at Cadillac, but at the time heading up Infiniti – decided to shake things up by renaming the entire lineup, resulting in the EX becoming the QX50 without any significant changes to the vehicle. Finally, two years after its latest rename, the QX50/EX/EX35 is getting its first overhaul for the 2016 model year. The new QX50 will be offered as either a RWD or AWD model and comes with four available option packages. 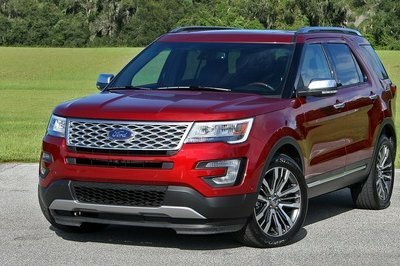 But will it be enough to inject some new life into the SUV? Updated 09/18/2015: Infiniti announced prices for the new, 2016 QX50 which goes on sale in this month at Infiniti retailers nationwide. 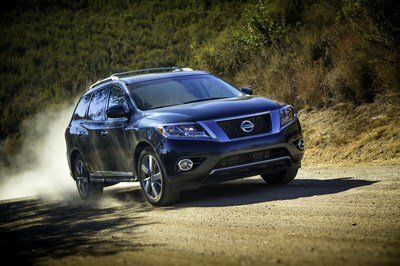 The new luxury crossover will be priced from $34,450 for the RWD version and $35,850 for the AWD version. 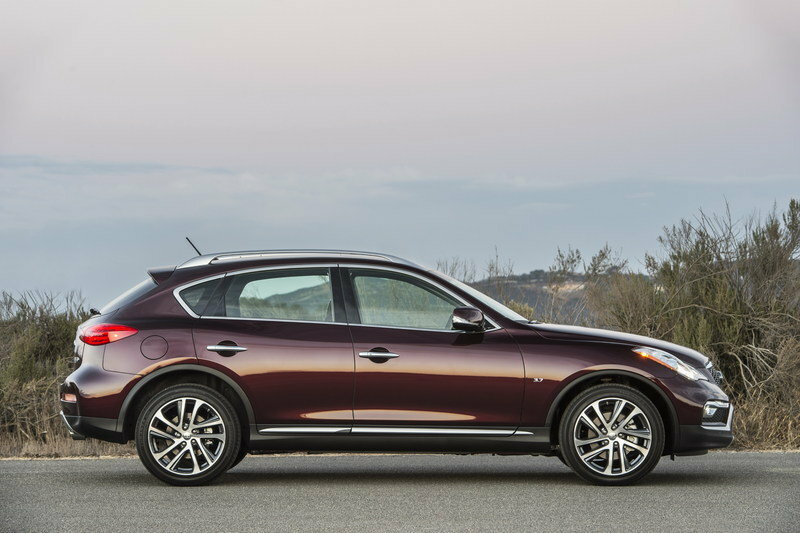 Continue reading to learn more about the 2016 Infiniti QX50. The QX50 employs a coupe-like design for the exterior styling, bringing it aesthetically closer to the rest of the Infiniti lineup. The 2016 model incorporates a new front bumper and lower fascia, L-shaped headlamps with LED daytime running lights, a restyled grille, new side mirrors with integrated LED turn signals, updated side sills, and a new rear bumper and lower fascia. The wheelbase has been extended by 3.2 inches, bringing it to 113.4 inches total, with overall length increased by 4.5 inches to 186.8 inches total. Ground clearance has also been raised .4 inches for RWD models (6.9 inches total) and 0.8 inch for AWD models (6.5 inches total). Around back, you’ll find a wide rear hatch and low load floor, plus a high-mounted spoiler with an integrated brake light, and chrome-finished dual exhaust tips. Up top, there’s a standard power sliding tinted glass moon roof with tilt feature, sliding sunshade and available roof rails. There are seven paint options to choose from, including Malbec Black, Midnight Garnet, Graphite Shadow, Liquid Platinum, Black Obsidian, Moonlight White and the new Hagane Blue. The available Deluxe Touring Package features HID xenon headlamps with AFS. 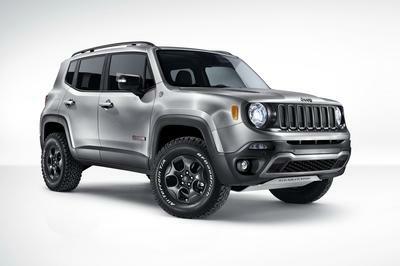 The Premium Package adds aluminum roof rails. The larger exterior dimensions of the new QX50 yield an 8.3-cubic-foot increase in interior volume (115.4 cubic feet total). Most of that extra space is in the second-row seating, where it needed to be, with legroom increased by 4.3 inches and knee room increased by 3.9 inches. Up front, there’s Infiniti’s signature “double-wave” instrument panel design, with high-contrast gauges, pin LED lighting mounted above the center console and the requisite analog clock. The instrument panel also features a 7-inch color display with an integrated trip computer and vehicle navigation. An available Infiniti Hard Drive Navigation System includes a color touch-screen display, Lane Guidance, 3D graphics, NavTraffic with real-time traffic info, NavWeather with real time weather updates and three-day forecasting (requires a SiriusXM subscription), voice recognition and Bluetooth connectivity for hands-free control and streaming wireless audio. There’s also Infiniti’s Intelligent Key system with push-button ignition and satellite radio capability. Leather wraps the shift knob and multi-function steering wheel. Seating for the driver is eight-way adjustable with a memory system, while the front passenger gets four-way adjustability. Both front seats are heated as standard on both the RWD and AWD models. A power remote up-folding feature with controls in both the front and hatch area make for a quick 60/40 split of the second row. Every model comes with aluminum interior accents, while maple accents are an option. Premium leather-appointed seating surfaces are standard and are available in three colors: Graphite, Wheat and Chestnut. Also standard for the first four years of ownership is Infiniti’s Personal Assistant, which provides owners with access to information and service requests that range from directory support and weather forecasts to hotel and dinner reservations. For safety, Infiniti fits each QX50 with an Advanced Air Bag System (AABS), which includes driver and front passenger seat-mounted side-impact supplemental airbags and roof-mounted curtain side-impact supplemental air bags. There are also three-point ALR/ELR seatbelts with front seat pretensioners, load limiters and adjustable upper anchors, front seat active head restraints and a Lower Anchors and Tethers for Children (LATCH) system for the rear outboard seats. Each of the four option packages comes with varying levels of interior equipment. The Premium Package includes a Bose audio system with nine speakers, two subwoofers, an AM/FM/CD in-dash head unit and USB mobile device connectivity, plus an advanced climate control system with a Plasmacluster air purifier, entry/exit assist for the driver’s seat and steering wheel, reverse tilt-down feature for the side mirrors, an auto-dimming rearview mirror with HomeLink Universal Transceiver, Maple interior accents, a power-tilt and telescoping steering column and a dual occupant memory system for the driver’s seat. The new Premium Plus Package throws in the Infiniti Hard Drive Navigation system, front and rear sonar and the Around View Monitor (AVM). AVM utilizes four external cameras to give the driver a virtual 360-degree view to aid when parking. The Deluxe Touring Package includes two-way power driver’s seat lumbar support, a coat hanger on the driver’s seat head restraint, eight-way power adjustable passenger’s seat, power up-folding second row seats, plus a hood around the gauge cluster with premium stitching. Finally, the Technology Package adds a large number of helpful gadgets, including land departure warning (LDW), lane departure prevention (LDP), intelligent cruise control (full speed range), distance control assist (DCA), and intelligent brake assist (IBA) with forward collision warning (FCW) and blind spot warning (BSW). BSW will show an indicator if a vehicle is detected in the blind spot area when the driver utilizes the turn signal, further signaling with an audible warning sound. 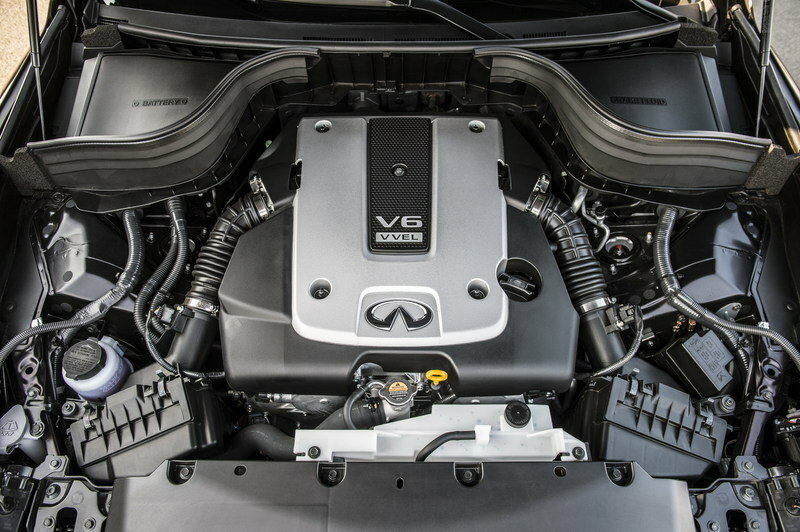 Behind that redesigned grille, you’ll find the same VQ37HR V-6 engine from last year, with 3.7 liters of displacement, 325 horsepower and 267 pound-feet of torque. Matched to this is a seven-speed automatic gearbox with manual shift mode and Downshift Rev Matching (DRM). Infiniti moved the engine as far back as possible, creating what it claims is a front mid-ship platform. This helps aid handling, which is refined further with subframe-mounted independent front double-wishbone suspension with aluminum-alloy upper and lower links, twin-tube shock absorbers and a stabilizer bar. In back, there’s an independent multi-link set-up with aluminum-alloy upper and lower links and axle housing, plus twin-tube shock absorbers and a stabilizer bar. Steering feel is polished thanks to a speed-sensitive power-assist system. Vehicle Dynamic Control (VDC) and traction control complement the power-assisted front and rear disc brakes fitted with ABS and Electronic Brake force Distribution (EBD), all of which come as standard features. Wheel and tire combos start with 18-inch eight-spoke aluminum alloy rollers with 225/55R18 all-season tires, or you could opt for the Deluxe Touring package with new 19-inch split five-spoke aluminum alloys with 245/45R19 all-season tires. The AWD-model QX50 features Infiniti’s electromagnetic Intelligent All-Wheel Drive system with active torque distribution management and an active center clutch. Despite it’s growth, the QX50 will still compete mainly with the BMW X1. The X1 checks in at $31,200 for the base sDrive28i, but the QX50 competes more with the $39,100 xDrive35i model, which comes standard with a 300-horsepower 3.0-liter inline-six engine and all-wheel drive. While BMW is the higher-end name, the Infiniti gives more bang for the buck with standard features that blow the X1 out of the water. The only issue is that the xDrive35i comes standard with all-wheel drive, but the 2015 QX50 required additional cash to get power to all four wheels. 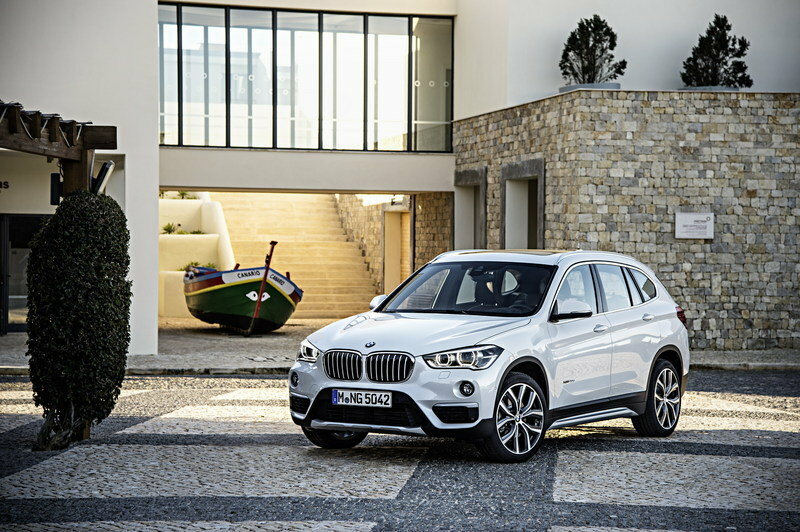 Read our full review of the BMW X1 here. The RDX is slightly larger than the 2016 QX50, and it has a roomier cabin, including 5.5 more inches of rear legroom and 5.6 cubic feet more cargo room. That said, it is not quite the performer of the Infiniti due to its less-powerful 3.5-liter V-6 that produces just 279 horsepower. But fuel economy is better, at 20 mpg city and 28 mpg highway with front-wheel drive. Like Infiniti, Acura prides itself in offering more bang for the buck than BMW or Mercedes, so the RDX’s cabin has similar equipment as the QX50. 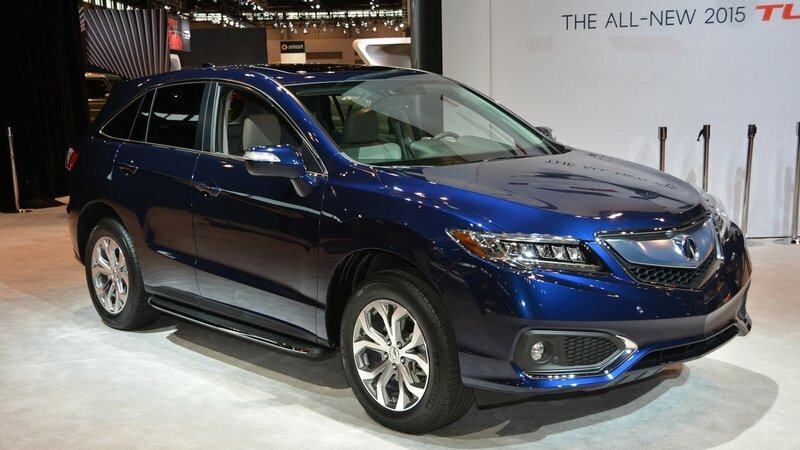 Read our full review of the Acura RDX here. When Infiniti completely renamed its lineup without changing the look of most of its models, I expressed my disappointment. However, as time passes on, it’s becoming clearer that the Japanese luxury brand is slowly trying to find a design language that works. The QX50 was definitely one of the models most in need of an overhaul, so it’s not surprising to see it happening now. The new look is solid, the extra interior room is welcome and the huge range of standard equipment is nice to see. Pricing remains up in the air, but if Infiniti plays its cards right, it may have done well to save this struggling crossover. When the Infiniti QX50 was originally introduced (as the Infiniti EX35), it was one of the first personal crossovers, foreshadowing what has become the hottest segment in the auto industry. It offered a choice of rear-wheel or Intelligent All-Wheel Drive, one of the most powerful engines in its class and a full-feature interior. It was also the first vehicle to offer technology features such as Infiniti’s innovative Around View® Monitor. 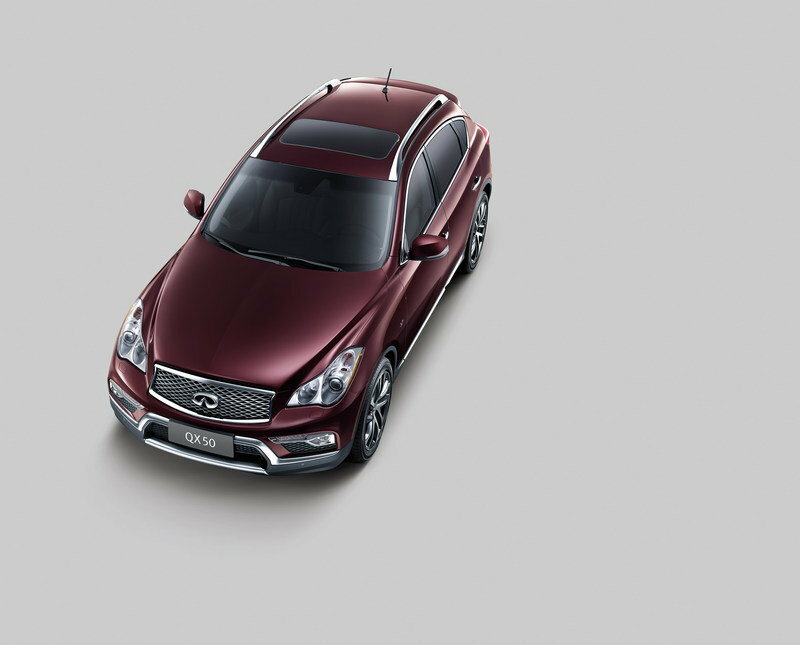 Today, the QX50 remains one of the most powerful and versatile personal crossovers in the segment. But much has changed for the 2016 model year – starting with the addition of 3.2 inches to the wheelbase and a revised exterior that brings its design closer in look and feel to other Infiniti models such as the sporty Q50 sedan. Standard content has also been increased, including the addition of a moonroof for all grade levels. Additionally, a new Hagane Blue exterior color is now offered. "Even as Infiniti is getting ready to significantly expand its product portfolio in the next few years – including production models based on the Q30, Q60 and QX30 Concepts – we’re also making significant enhancements to our current lineup," said Randy Parker, vice president, Infiniti Americas. "Following the 2015 introductions of the updated Infiniti Q70 and the addition of the Q70L long-wheelbase version and new range-topping QX80 Limited full-size SUV, we’re kicking off model year 2016 with the updated QX50." The 2016 Infiniti QX50 luxury crossover provides a unique combination of a right-sized exterior with a luxurious interior environment and suite of advanced technology features. 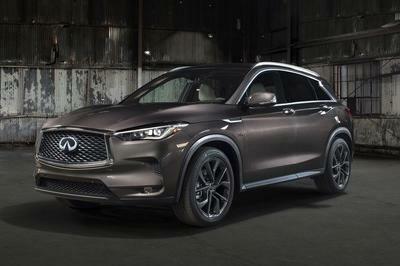 The QX50’s coupe-inspired luxury crossover design – a fusion of coupe and sport utility vehicle – has been enhanced for 2016 with a new front bumper and lower front fascia, new LED Daytime Running Lights, new signature Infiniti-style double-arch front grille, new side mirrors with integrated LED turn signals, updated side sill styling, and new rear bumper and lower fascia. New 19-inch aluminum-alloy wheels are added as part of the Deluxe Touring Package. The wheelbase is now 3.2 inches longer (113.4 inches versus previous 110.2 inches) and overall length has increased 4.5 inches (186.8 inches versus previous 182.3 inches). The result is an 8.3 cubic feet increase in interior volume (115.4 cubic feet total volume versus the previous 107.1 cubic feet). Most of the increase in interior space can be felt in the 2nd row – rear legroom grows by 4.3 inches and rear knee room is boosted by 3.9 inches. In addition, ground clearance has been enhanced to 6.9 inches (+0.4 inches) for rear-wheel drive models and to 6.5 inches (+0.8 inches) for all-wheel drive models – giving drivers a higher vantage point for improved visibility. As in previous years, the QX50’s wide rear hatch and low load floor make the QX50 a versatile vehicle for both everyday and weekend use. The exterior includes many signature Infiniti touches, including large L-shaped headlights with new LED Daytime Running Lights, available xenon auto-leveling headlights with Adaptive Front lighting System (AFS), integrated fog lights, distinctive LED taillights and "dynamic arch" profile. Other exterior features include a high-mounted rear hatchback spoiler with integrated brake light, chrome-finished dual exhaust tips, standard power sliding tinted glass moonroof with tilt feature, sliding sunshade and one-touch open/close and available roof rails. The QX50 also features a standard courtesy light integrated in the driver’s outside mirror, which welcomes the driver to the vehicle. Seven exterior colors are offered for 2016: Malbec Black, Midnight Garnet, Graphite Shadow, Liquid Platinum, Black Obsidian, Moonlight White and new Hagane Blue. The 2016 QX50’s dramatic interior again offers an invigorating and engaging environment, one that is both indulgent and inspiring. 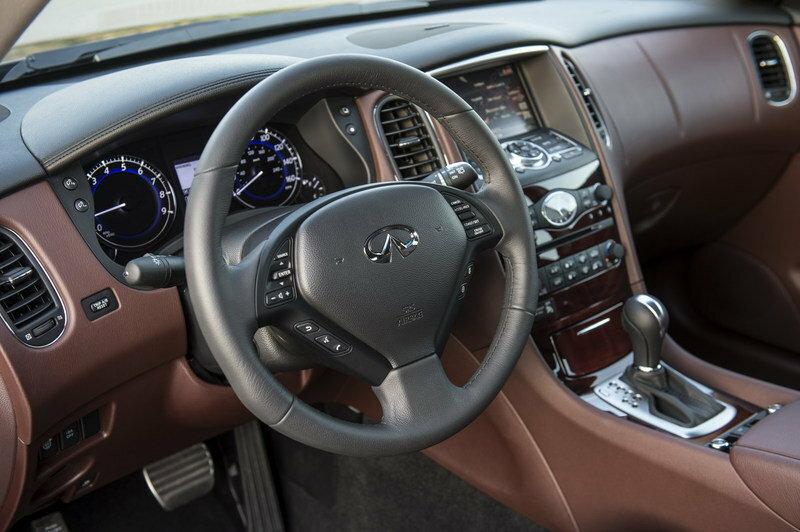 The driver-focused cabin layout features an Infiniti signature "double-wave" instrument panel, easy-to-read high-contrast gauges, hospitality lighting with a pin LED light mounted over the center console and Infiniti signature analog clock. The instrument panel also features a 7-inch color display with Infiniti controller for the trip computer and additional vehicle information. The available Infiniti Hard Drive Navigation System includes a color touch-screen display, Lane Guidance and 3-D building graphics, NavTraffic® with Real-Time Traffic Information, NavWeather™ with Real-Time Weather Information and 3-day forecast (SiriusXM subscription required, sold separately), Infiniti Voice Recognition for audio and navigation, Streaming Audio via Bluetooth® wireless technology. Other technology systems include Bluetooth® Hands-free Phone System, Infiniti Intelligent Key with Push Button Ignition and SiriusXM Satellite Radio (SiriusXM subscription required, sold separately). Comfortable seating is provided by an 8-way power driver’s seat and a 4-way power passenger’s seat. Heated front seats are now standard on both rear-wheel and all-wheel drive models. Also available are driver’s seat memory system, an 8-way power front passenger’s seat and a power remote up-folding feature with dual controls (operated from the front or the hatch area) for the 2nd row 60/40 split seat. There is also a leather-wrapped shift knob, and leather-wrapped steering wheel, which includes controls for audio and cruise control. All models feature aluminum interior accents, with available maple interior accents. The available Bose® Premium Audio System includes 11 speakers (including 2 subwoofers), AM/FM/CD in-dash changer and USB connection port for iPod® and other compatible devices. The advanced Around View® Monitor (AVM), available with the new Premium Plus Package, utilizes four small cameras located front, side and rear to give the driver a virtual 360° view of the outside of the vehicle and help aid when parking. The AVM system includes Front and Rear Sonar. The interior is offered with standard premium leather-appointed seating surfaces, available in three colors – Graphite, Wheat and Chestnut. Offered at no charge for the first four years of ownership is the Infiniti Personal Assistantä, which provides new Infiniti owners access to a team of professional personal assistants from a registered phone. Information and service requests range from directory assistance and weather forecasts to arranging tasks such as hotel or dinner reservations on the caller’s behalf. 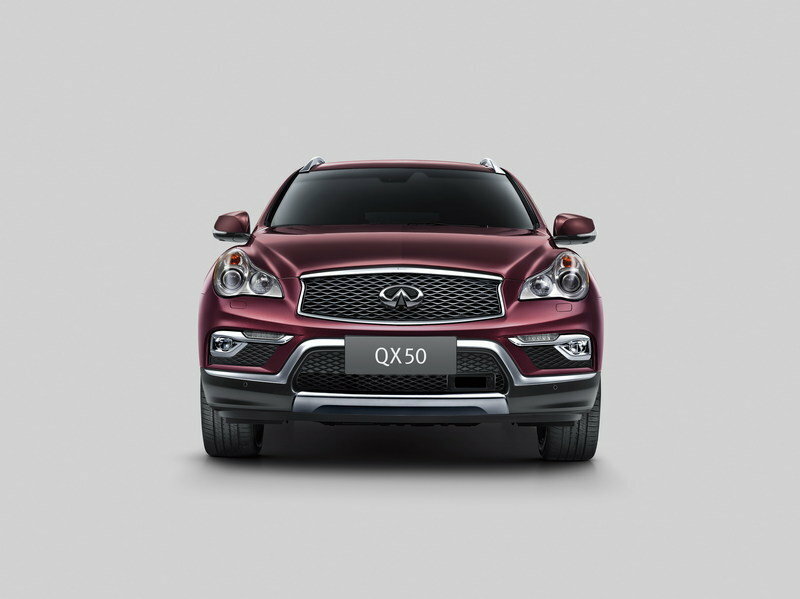 Under the QX50’s dramatic body is an equally advanced platform and powertrain. The FM (Front Midship) platform helps provide high levels of handling performance. 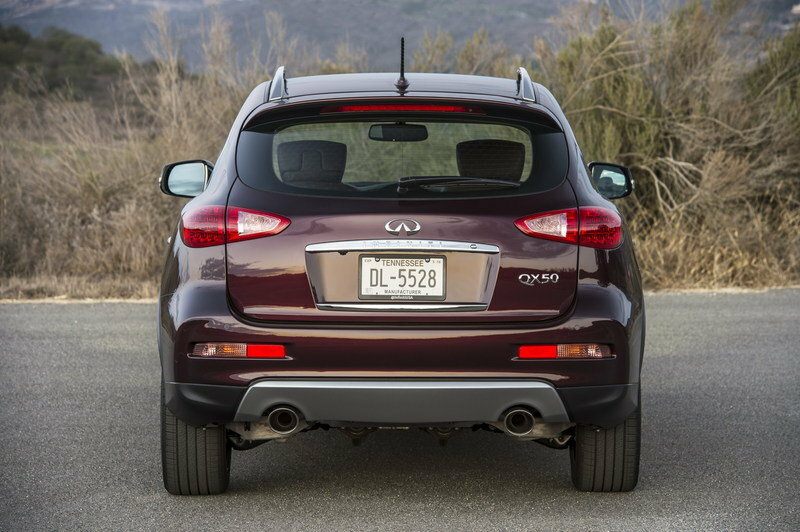 Every 2016 Infiniti QX50 comes with a VQ37VHR 3.7-liter V6 engine rated at 325 horsepower and 267 lb-ft of torque. The engine is matched with a 7-speed automatic transmission with manual shift mode, DS mode with Downshift Rev Matching (DRM) and Adaptive Shift Control. Superb handling is provided by a subframe-mounted independent front double-wishbone suspension with aluminum-alloy upper and lower links, twin-tube shock absorbers and stabilizer bar. The rear suspension is an independent multi-link design with aluminum-alloy upper and lower links and axle housing, twin-tube shock absorbers and stabilizer bar. Steering is provided by a vehicle speed-sensitive power-assisted steering system. 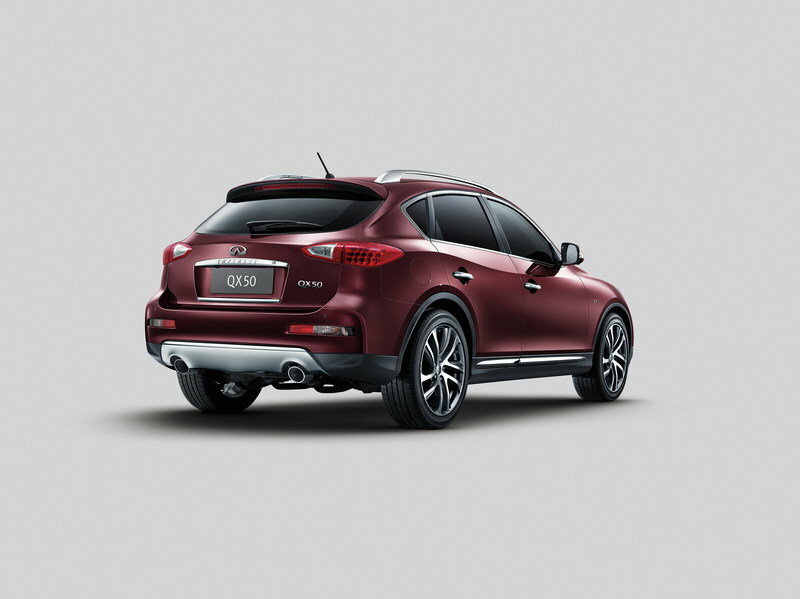 The QX50’s standard braking system includes power-assisted front and rear discs (vented front) and standard Anti-lock Braking System (ABS) with Electronic Brake force Distribution (EBD) and Brake Assist. Also standard is Vehicle Dynamic Control (VDC) with Traction Control System (TCS), while an advanced Intelligent Cruise Control (Full-Speed Range) is optionally available. Available wheel and tire combinations include standard 18-inch 8-spoke metallic finish aluminum-alloy wheels with 225/55R18 all-season tires or new 19-inch split 5-spoke aluminum-alloy wheels with 245/45R19 all-season tires, which are offered as part of the Deluxe Touring Package. Infiniti QX50 AWD models feature Infiniti’s Intelligent All-Wheel Drive system, which utilizes an active torque distribution management system with an active center clutch. The electromagnetic AWD system responds quickly, helping to minimize wheel slip in adverse conditions. Standard safety equipment includes an Infiniti Advanced Air Bag System (AABS); driver and front passenger seat-mounted side-impact supplemental air bags; roof-mounted curtain side-impact supplemental air bags for outboard occupant head protection; and a Tire Pressure Monitoring System (TPMS). Also standard are 3-point ALR/ELR seat belts (driver ELR only) and front seat belts with pretensioners and load limiters and adjustable upper anchors, front seat Active Head Restraints and the LATCH (Lower Anchors and Tethers for CHildren) system for the rear outboard seating positions. The QX50 also features advanced Zone Body Construction with front and rear crumple zones to help disperse crash energy around the passenger compartment. Available as part of the Technology Package is the Blind Spot Warning (BSW) system. BSW illuminates an indicator light if another vehicle is detected in the blind spot area. If the driver then uses the turn signal, the indicator flashes and an audible warning sound. 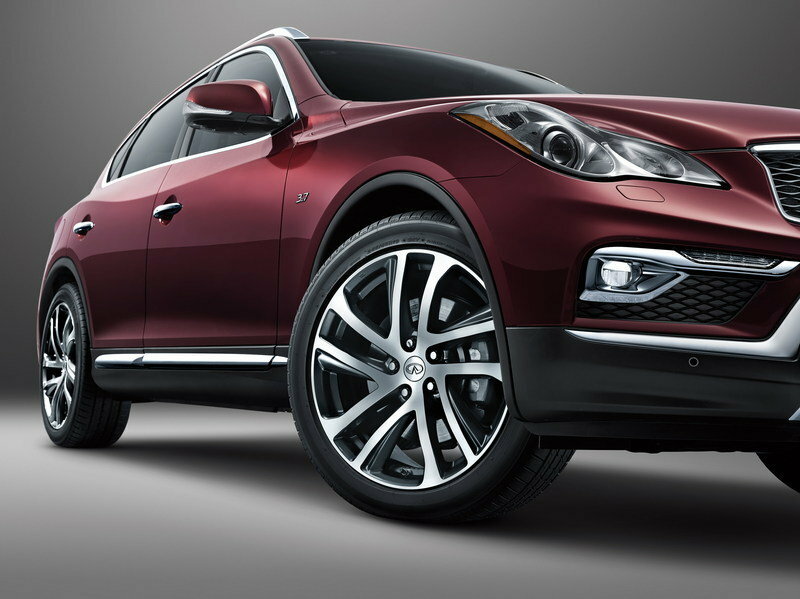 The 2016 Infiniti QX50 is available in two models: QX50 and QX50 AWD, with four option packages available. The Premium Package includes Bose® Premium Audio System with 11 speakers, including 2 subwoofers, Advanced Climate Control System (ACCS) with Plasmacluster® air purifier, dual occupant memory system for driver’s seat, outside mirrors and steering wheel, entry/exit assist for driver’s seat and steering wheel, outside mirrors with reverse tilt-down feature, auto-dimming inside mirror with HomeLink® Universal Transceiver Maple interior accents, power tilt and telescopic steering column and aluminum roof rails. The new Premium Plus Package adds the Infiniti Hard Drive Navigation, Around View® Monitor (AVM), and Front and Rear Sonar System. 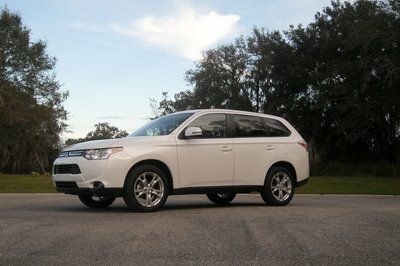 The Deluxe Touring Package features 19-inch split 5-spoke aluminum-alloy wheels with 245/45R19 all-season performance tires, High Intensity Discharge (HID) xenon headlights, Adaptive Front lighting System (AFS) with auto-leveling headlights, 2-way power driver’s seat lumbar support, coat hanger on driver’s seat head restraint, 8-way power passenger’s seat, power up-folding 2nd row seats, meter hood with premium stitching. The Technology Package features Lane Departure Warning (LDW) and Lane Departure Prevention (LDP), Intelligent Cruise Control (Full-Speed Range), Distance Control Assist (DCA), Intelligent Brake Assist (IBA) with Forward Collision Warning (FCW) and Blind Spot Warning (BSW). 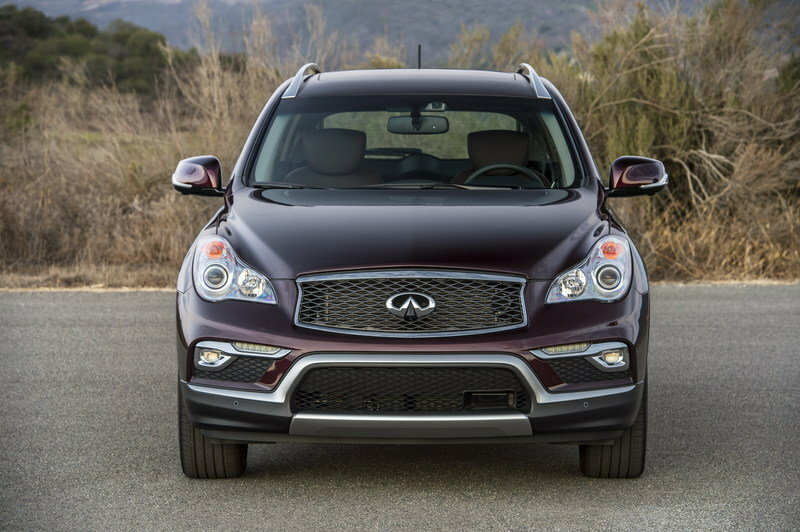 "The enhanced 2016 Infiniti QX50 delivers a rewarding experience for both driver and passengers," said Parker. "With its standard 325-horsepower 3.7-liter V6 and range of advanced safety, driving and parking aids such as Around View® Monitor, driving is a pleasure. 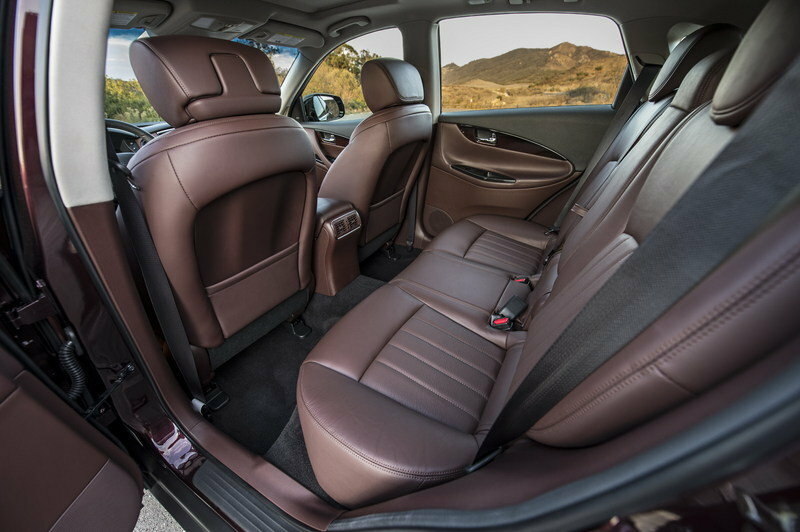 And with the added rear seat roominess and cargo flexibility, passengers will enjoy riding in an QX50 more than ever before."